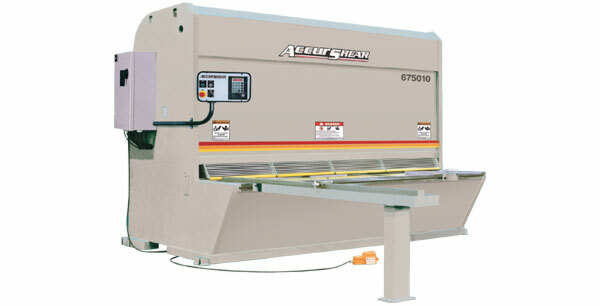 The Accurpress Accurshear 6625, 6750, 61000 SERIES hydraulic shears offer 5/8”, 3/4” and 1” capacities. Shear capacity up to 80,000 tensile and 44,000 yield strength. Pendant control c/w on/off buttons, mode selector switch,and stroke control dial. Backgauge control includes LED display, inch or metric conversion, go-to-position function, 99 pre-select programs, hour meter and stroke counter. 48″ backgauge travel with automatic swing up backstop at full extension. 4-edged blades, top and bottom, high carbon, shock resisting. 4′ squaring arm c/w steel rule with 1/16″ and 1 mm increments. T-slot in front of table. 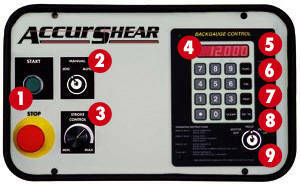 All of the Accurshear’s control buttons – Stroke control, Stroke counter, and Backgauge selects – are located on a front console. To make it readily accessible, the console is mounted to a swing arm pendant from the side of the Accurshear. Jog Mode, Manual Mode, and Auto Cycle. The backgauge control features a keypad display, LED readout, and ninety-nine pre-select programmable positions. Under normal use, the operator keys in the desired backgauge setting, presses the “Go To” key, and the backstop bar moves to position. The Accurshear may also be programmed for single-step or sequential shearing. To accommodate high accuracy, the backstop bar actually moves slightly beyond the desired position and then comes forward to eliminate any clearance between the lead screws and nuts. The shear operator may also choose the backgauge retract feature via the key switch. This retracts the stop bar once the hold-downs clamp the material just prior to the shear cycle to avoid material wedging between the shear knives and stop bar.